Diabetes patients monitor their blood glucose by pricking the skin and drawing blood, which is then smeared onto a disposable test strip. Some with Type 2 diabetes might test only once a day but those with Type 1 diabetes and many with more complicated Type 2 diabetes will test multiple times each day. The results of their tests will help assess how to tailor their insulin doses to best manage the disease on an ongoing basis through meal- and activity-planning as well as timing and dosage of medication. Some newer blood sugar meters that communicate directly with insulin pumps are simplifying this process for many patients, making diabetes management more accurate and patients more likely to comply with therapy. Often using radiofrequency to wirelessly transmit blood glucose readings to linked pumps, newer monitors help eliminate the risk of incorrectly entering data using a manual process and simplify the disease management process for patients. Glucose meters that have this capability are usually designed to work exclusively with a particular partner insulin pump. For example, the One Touch Ultra Link meter and the Nova Max Link meters are programmed for use with the Medtronic Paradigm insulin pump. The One Touch Ping blood sugar meter is designed to work with the Animus One Touch Ping insulin pump. Both the One Touch Ping and the One Touch Ultra blood sugar meters are made by Lifescan. Nova Biomedical makes the Nova Max Link. The newest wireless meter, the Contour NEXT Link, produced by Bayer and Medtronic, is compatible with the Medtronic MiniMed Paradigm insulin pump. 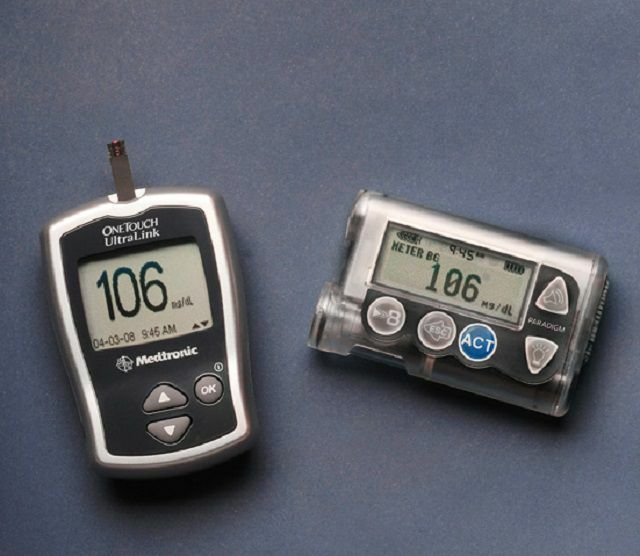 All three of these meters are used in a similar way as conventional blood sugar meters except that the glucose test result is wirelessly sent to the insulin pump. This information can then easily be used on the pump to calculate a precise bolus dose of insulin. Depending on the meter and pump used, there are many other features that can be accessed. Many of these newer systems also come with the capability to wirelessly download meter results to a computer or uploaded to a care management system. Historical information on blood glucose helps healthcare providers and patients to improve disease management going forward.